After upgrading all PC's and laptops to Windows 8, the Vostro 200 encountered network driver problems. The generic Intel driver that comes with Windows 8 fails to correctly recognize the network card. So I installed the (Vista) driver (from ftp.dell.com) which only works intermittently. After hundreds of installs of drivers found on various places on the web I really ran out of options. Hopefully someone here has the right solution. Right Click the file and select the 'Run As Administrator' to install the driver. Alternatively, you can try installing the Intel driver update utility that may find the compatible drivers automatically. Please refer to the following link: http://intel.ly/m7tqmV . Download the necessary drivers. Thx for your feedback. I had already installed the Intel driver update utility, but to no avail. This weekend I decided to go back to Windows Vista on the Vostro 200. I just couldn't spent more time on this system. So I am no longer able to test your suggestion to install the driver in compatibility mode. The link to the Windows 8 compatibility chart is interesting. In my experience the Vostro220 and Latitude 6510 are 100% compatible with Windows 8. 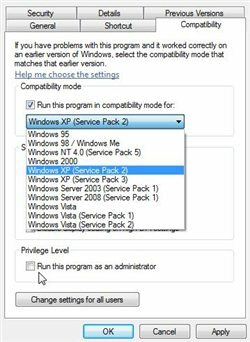 Systems shipped with Windows Vista/7 may have the hardware compatibility with Windows 8. However, we may face difficulty in finding the compatible drivers. Let me know in case you need any further assistance. I would be glad to assist. Does the Dell Vostro 200 will have a driver realese in windows 8. Cause i have 2 unit of dell vostro 200 and i do thinking for the other one to be windows 8..
really want to experience windows 8 madly in his full hardware... ^_^.! thanks for hearing this in advance!